Failing wastewater systems are not only expensive to replace but also highly detrimental to the surrounding environment and a liability to property owners and residents. In the experience of True Water Australia, and with our expertise in the field, it is often far more cost-effective and beneficial to replace worn systems entirely rather than try to fix failed or deteriorated components. Our knowledge, research and experience have provided ideal solutions to many customers with existing systems that have failed, either due to inferiority or simply having come to the end of their projected lifespan. 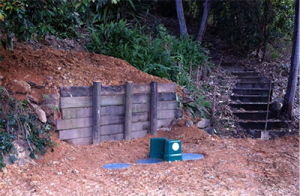 The council required a high quality sewerage treatment solution from our clients. However the Nova Clear membrane treatment system was continually failing as often as every couple of months and was proving exceptionally expensive to fix and an ongoing issue. The membrane technology used by the existing system was expensive but having only a short lifespan, also requiring extremely technical electronics to operate. Due to the ongoing costs of maintaining the facility and with further restoration requirements impending, True Water Australia proposed an entire system replacement as the solution for a trustworthy and reliable system with no significant maintenance fees or requirements. A high quality, long-lasting sewerage treatment solution was required in a location with no vehicular access in addition to the removal of the old, redundant system. 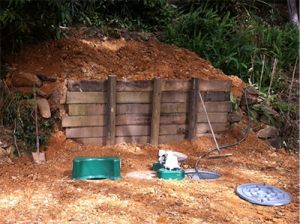 The new wastewater system was required to provide tertiary treatment and extensive durability and longevity. In addition to this, it needed to be lightweight and manageable enough to be easily manoeuvred into position without the use of heavy machinery. On True Water Australia’s recommendation and liaison, the owners of the property decided on a CE-1500EX advanced sewerage treatment plant. Being a private residence, it was essential that the property be without wastewater facilities for the bare minimum of time and that any disruption be as insignificant as possible. 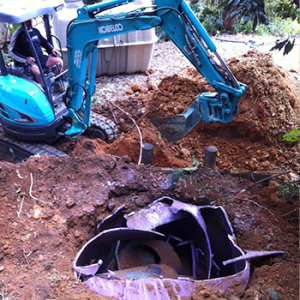 True Water Australia accomplished the decommission of the failing system and the installation and initialisation of the new CE-1500EX home sewerage system within a single day. 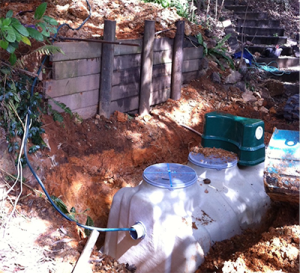 Thanks to True Water Australia’s experience, the site was prepared in advance of disconnecting the wastewater service. It took just three hours to disconnect and remove the redundant sewerage system and then install and connect the new CE-1500EX system, As always, commissioning, stringent testing and quality assurance was undertaken at completion. By the end of the day the new system was in use, the failing membrane system just a memory. True Water Australia installed a high quality sewerage treatment plant that met the local governments high environmental requirements, while ensuring the system will last and remain completely trouble-free. True Water Australia’s sewerage solution for the client has lowered the cost of operating and only requires the simplest of maintenance to the relief and satisfaction of the property owners.